Changes to the Universal Postal Union affect online sellers in immense ways. In this blog, you will learn just what the UPU is, why China has been benefiting, and how the U.S. is pushing back against one of the world’s oldest international organizations. What is the Universal Postal Union? Formed over 140 years ago, the Universal Postal Union stands as the second-oldest international organization. The UPU was created to promote and advance the global flow of information and ideas through the best form of communication at the time – the mail. Though created with an idealistic goal, having one independent organization to handle the messy details of sending things between countries was very advantageous for the countries involved. What is the UPUs Impact? 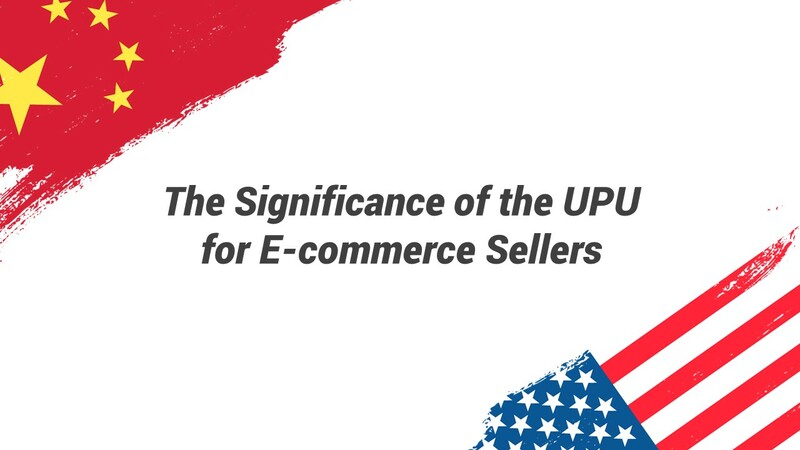 One of the most popular podcasts here in the Newegg office explains it best, but essentially, the Universal Postal Union is largely responsible for the abundance of inexpensive Chinese goods entering the U.S. and other nations. As a quick example, if a customer orders a product shipped from China and another shipped from the US, there is a significant chance that the product coming all the way from the other side of the planet will cost much less to ship than from the local address. This is due to the UPU’s negotiated rates with the U.S. Postal Service. How Does this Affect the United States and China? These aforementioned rates were established in the 1960s to aid weakening economies such as China, at the burden of more stable nations. Today, these rates are viewed as wildly outdated and in need of renegotiation – because China isn’t exactly in the same economic standing as they were sixty years ago. Left unchanged, the result has lead to the United States bankrolling a large portion of China’s U.S. shipping. Now the current Trump administration is claiming that this is costing the U.S. $300 million per year. This is a well-known issue and has gained support from aggrieved partner nations and shipping companies like USPS to increase the rates that China pays. What to Look Out for in 2019? The UPU has since expressed their commitment to better serve all of their 192 member countries. However, the U.S. is well-poised to negotiate more favorable terms as they process about 50% of global mail. Watch out for some manner of increasing small parcel rates for Chinese sellers and the resulting surge in warehousing demand for their bulk-shipped products. This action is unprecedented and even experts close to the situation don’t know how this could turn out. This sentence has been used for many policy changes lately, but if the U.S. steps away from yet another global agency, it will create a power vacuum that China is almost certain to fill – further stymying the goal of the United States and its partners. One thing is for sure, experts find if doubtful that both the U.S. and UPU can establish or maintain new bureaucratic organizations to handle all of this before changes take effect January 2020. How Can International Sellers Help Their Business? Nothing is worse for businesses than uncertainty. For international sellers shipping into the U.S., we advise that you hedge your bets and plan for shipping rates to increase in some manner. So, what can be done to preserve margin and accurately plan your business? For international Marketplace Sellers, Newegg currently offers 6 months of FREE inventory storage for any new or current seller that has not yet utilized our fulfillment service, Shipped by Newegg. Though this service and offer can’t help with the instability of tariffs and the UPU, it can provide you a reliably low-cost and dependable fulfillment solution to help soften the blow to your business. All in all, the UPU has a problem on their hands, and it’s one that many of their largest members believe needs to be fixed. No matter which outcome pans out, in a long-term view, U.S. sellers shipping domestically deserve to compete on an even playing field. However, there is no knowing the short-term risks and pains that have yet to present themselves should the U.S. walk away from the table.